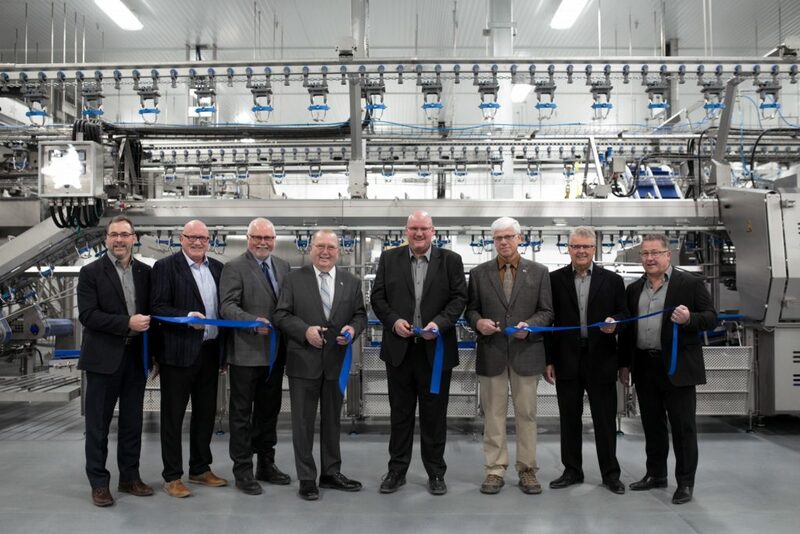 HyLife, a Manitoba integrated pork processor, headquartered in La Broquerie, with business around the world, is proud to announce the completion of its pork processing facility expansion and upgrade project. The bulk of its investment was focussed on the modernization of the Integrated Pork Processing Plant in Neepawa that now boasts leading-edge technology and is one of the most sophisticated facilities in Canada. “We committed to this significant expansion and upgrade in response to our market growth in Japan and China,” said HyLife President Claude Vielfaure. “Our investment is totalled at $176 million to ensure we can meet both the quantity and the very high quality standards our customers are seeking. Our new technology has now been upgraded to standards that are considered world class,” he added. The governments of Canada and Manitoba have invested $2 million toward HyLife’s processing expansion through Growing Forward 2, the multilateral agreement which provides strategic investments in agricultural programming and projects. This investment was made to support the purchase of modern processing and packaging equipment to be used in the new expansion. HyLife’s expanded investment in Manitoba reaches beyond the plant in Neepawa. Killarney is now home to a new feed mill as well as barn production investments in western Manitoba. These expansion projects have already resulted in 165 additional jobs to bring the number of HyLife employees to 2,000 in Canada. HyLife’s commitment to an integrated Farms to Foods strategy focuses all internal resources and activities on continuous improvement processes. These support the innovation of nutritional and genetic pork programs to help deliver specific meat quality attributes demanded by customers including enhanced shelf life processes. Strategic Partnerships and Positive Relationships – Thanks to trade agreements, market access by the Government of Canada and strategic partnerships, HyLife is growing in Japan, China, Mexico and South Korea where export opportunities are focused on fresh chilled pork. Mayor Adrian de Groot of the Town of Neepawa, expressed heartfelt congratulations to HyLife Foods on their expansion in this region of the province. “Neepawa has been a partner with HyLife since its beginnings here and we look forward to continued positive relationships in the future. As one of the major employers in this area, HyLife continues to add diversity and opportunity to not only Neepawa but also the surrounding communities. There is a vibrancy that is felt throughout the region,” de Groot said. “It is exciting that consumers around the world have access to our high quality pork. We value our outstanding suppliers, partners and communities across the province and we’re proud to put Manitoba on the world map,” said Vielfaure.